Car Wash Club – Saves You Money Every Day! The Shine On! Unlimited Wash Club program provides the convenience of getting unlimited washes/services as defined below for a monthly amount per vehicles at Speedy Sparkle Car Wash (SSCW). 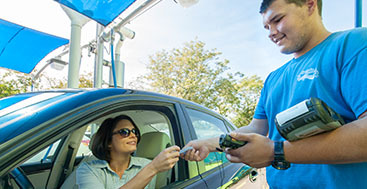 This program requires a windshield barcode tag in each participating vehicle for identification purposes and is valid on the designated vehicle only. The tag must be affixed to the lower corner of the windshield on the driver’s side and may not be removed or damaged. The tag will not be honored if damaged or moved to a different vehicle. If a tag is damaged, vehicle sold, or windshield replaced, SSCW will happily transfer membership to a new bar code to be installed in your vehicle. This program requires authorization for SSCW to charge the monthly program fee to your credit card account each month. There is no time commitment and you may cancel your club membership at any time. SSCW will be the billing party shown on your bill. The monthly program fee may be increased without notice, but will be posted at the SSCW location 30 days prior to the effective date. Active members of Shine On! 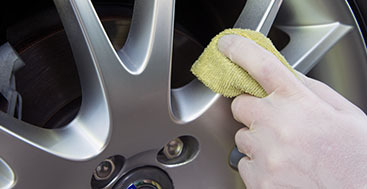 Unlimited Wash Club will receive a $10.00 discount on detail packages for your vehicle AND 10% off all merchandise purchased. The benefits of the designated Shine On! Unlimited Wash Club program cannot be combined with other discounts or club offers, coupons, gift cards/certificates, or complimentary services. Additional a la carte services may be added on any visit for the menu price of the added service and upgraded wash services may be enjoyed for the difference in regular price. Washes/services will be available during normal business hours, subject to early closures, including, but not limited to inclement weather and equipment failure. Program applies to one vehicle per membership, but can be transferred to a new/different customer vehicle by visiting our location. I understand that I must be at least eighteen (18) years of age to participate in the Shine On! Unlimited Wash Club program. I may, however, be of any legal driving age to bring a vehicle to SSCW under this Agreement. 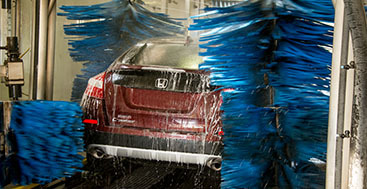 Vehicles enrolled in the program must fit in the wash tunnel and not require hand wash service. Visit our location and tell us that you want to change or cancel participation in the program. Cancellations will be at the next monthly charge date. Program changes (upgrade or downgrade) will be effective same day of change. Your monthly charge date will be adjusted to 1 (one) month after the upgrade/downgrade. Email info@speedysparklecarwash.com to cancel the program, include a return phone number for a return call so that we can call back and confirm your request. No refunds or partial credit will be issued for charges already submitted. Once billed, no refunds or partial credits will be applied for the remaining days in the month, but full benefits/use of the program will remain in effect for that month. The SSCW Shine On! Unlimited Wash Club program bar code is associated with a single vehicle. SSCW monitors use and/or abuse of the Shine On! Unlimited Wash Club program. SSCW retains the right to cancel a member’s participation in the Shine On! Unlimited Wash Club program at any time, for any reason. The program is operated by SSCW and, in its sole discretion, may be cancelled or changed, at any time, without notice. Credit cards declined on the billing date are given a grace period of seven (7) calendar days. SSCW will continue to attempt to charge the credit card during the seven (7) calendar day grace period. Washes will not be available on the bar code until the account is updated with new expiration date, card number, etc. SSCW store management will attempt to contact customers via phone and/or email during the grace period to notify them of card expiration, or other issues. I UNDERSTAND THAT BY SUBSCRIBING TO THE SHINE ON! UNLIMITED WASH CLUB PROGRAM, AND BY SIGNING THE AGREEMENT, I WILL CONTINUE TO BE CHARGED THE MONTHLY FEE INDEFINITELY UNLESS I DISCONTINUE AS PER THE PROGRAM PROCEDURES FOR UPGRADES, DOWNGRADES, CANCELLATION. I AGREE TO MAKE PAYMENTS OF THE MONTHLY FEE PERMITTED UNDER THIS AGREEMENT. I UNDERSTAND THAT MONTHLY CHARGES PERMITTED UNDER THIS AGREEMENT WILL BE MADE ON THE SAME DAY EACH MONTH. I UNDERSTAND THAT MONTHLY CHARGES PERMITTED UNDER THIS AGREEMENT MAY BE INCREASED WITHOUT NOTICE. SSCW WILL BE THE BILLING PARTY SHOWN ON YOUR BILL. SSCW is committed to maintaining your trust by protecting personal information we collect about you, our customer. We use your information to provide you with the service you expect and deserve. Making you happy does not include renting your name out to others to sell you their stuff. Of course, we need to keep you informed about our business and the services that make you happy. Whenever you do not want us to keep you informed, options like “stop” and “unsubscribe” are always available. That’s it. 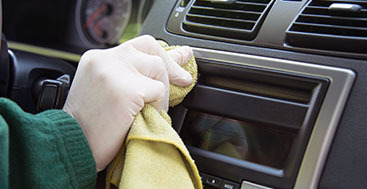 All full service wash customers benefit from the exclusive 3 Day Clean Car Satisfaction Guarantee, which allows the customer to return for a free "Speedy Exterior Wash" for any reason within the 3 days when a "Full or Deluxe Service"wash is purchased. I rate Speedy Sparkle 5.0 on quality, Value, and timeliness! ©2016 Marketing 360® - Do not copy.All rights reserved.